Upper Lake Powell, in October 2016. LONGMONT, Colo. – After several years of warm-and-fuzzy talk, water leaders in Colorado are on the verge of a squabble. At issue is just how much water in the Colorado River remains to be developed and under what terms. The Continental Divide again divides the protagonists as well as the waters. Two water districts representing the water-rich but more sparsely populated Western Slope in January launched the Joint West Slope Roundtable Risk Study. 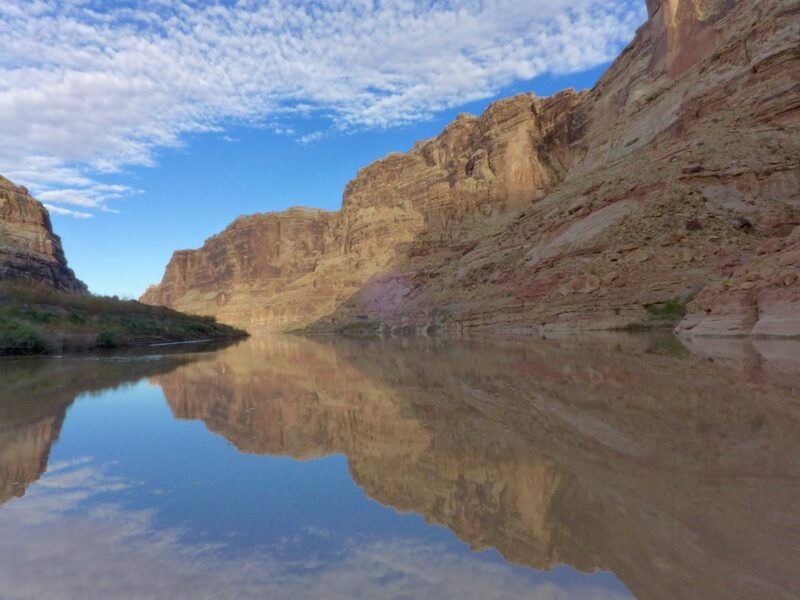 The idea, first hatched at a joint meeting in Grand Junction of the four water roundtables on the Western Slope, is that even now, after the drafting of a state water plan, much remains unknown about the Colorado River, the state’s go-to source for both farms and cities. Not so, responded Eric Kuhn, general manager of the Glenwood Springs-based Colorado River Water Conservation district, one of two Western Slope districts to sponsor the study. The other is Durango-based Southwest Colorado Water Conservation District. The initial phase of the study, completed this fall, looked at the risk of water levels in Lake Powell dropping below manageable levels. The river district and other West Slope entities now want to complete additional analysis of numerous supply and demand scenarios. Demand reduction would have to be “big” if drought comparable to that of 2002 or that of the mid-1950s revisits the region, he said. In a Nov. 15 memo, Kuhn took issue with the review of the study by Glenwood Springs-based hydrologist Kerry Sundeen conducted for the Front Range Water Council. Sundeen’s challenge to the findings came as Western Slope water groups were preparing to seek state funding for the second phase of the study. 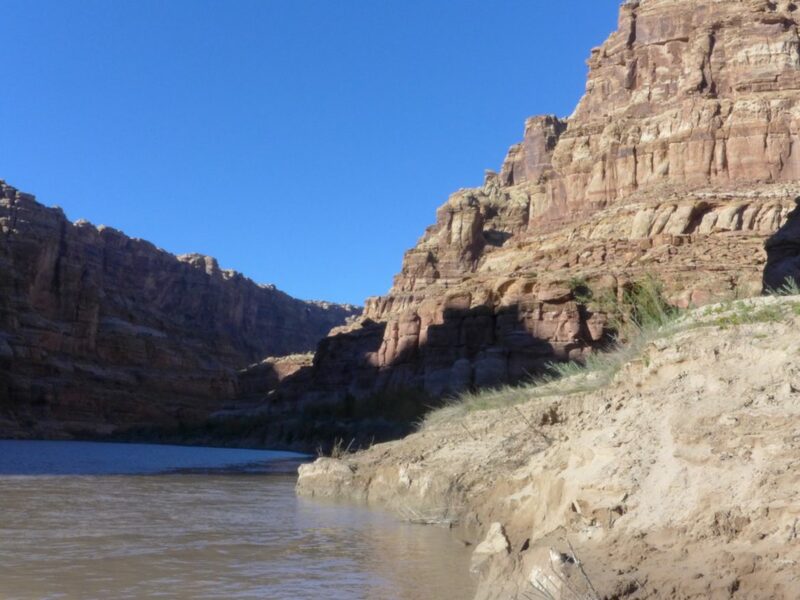 The application to the Colorado Water Conservation Board, the state’s lead water policy agency, has been delayed until January or March, according to Jim Pokrandt, community affairs director for the River District and chair of the Colorado River Roundtable. In his memo, Sundeen also warned that a Western Slope-led study might lead to “confusion as to the state’s position on Colorado River” in negotiations with other states. Sundeen’s warnings and Lochhead’s protest reveal traditional tensions in Colorado, where 90 percent of the state’s 5.4 million residents live east of the Continental Divide, mostly at the foot of the Rocky Mountains. Close to 90 percent of Colorado’s agriculture production also occurs east of the Divide. But 80 percent of the state’s water originates west of the Continental Divide, mostly in the form of snow. One of the many banks of silt that have emerged in upper Lake Powell as the reservoir levels have dropped. Just how much of Colorado’s water remains available for development is the giant question still dangling in Colorado. The state water plan didn’t seek to answer the question. The official estimate is somewhere between none and 800,000 acre-feet. Independently, Kuhn has estimated 150,000 acre-feet. What may be more important yet is how much water will be available if drought prevails and if the climate becomes warmer. The 1922 Colorado River Compact requires Colorado and the three other upper-basin states to allow 75 million acre-feet to flow downstream to Lee’s Ferry, at the mouth of the Grand Canyon, in rolling 10-year cycles. Lake Powell has become the bank vault for ascertaining those obligations can be met. But how much more water can be developed out of the Colorado River without violating compact requirements? In September, at the River District’s annual conference in Grand Junction, Kuhn pointed out that the compact governing water use among the upper-basin states apportions 51 percent of their water (roughly half in the total river) to Colorado. But, in the last 10 years, Colorado has been using 58 percent. At least two ideas for major water diversions to the Front Range have been introduced in the last decade, one from the Yampa River and the other from Flaming Gorge Reservoir. The Front Range Water Council was first to register opposition to the Western Slope’s plan to get state funding for a new study. “We believe these investigations are best conducted in a statewide or upper basin manner with all interested water users represented, rather than by particular sub-regions or individual roundtables,” said Lochhead’s letter. Other water providers on the Eastern Slope have also talked about the Western Slope study. Meeting in Longmont, along the St. Vrain River, the South Platte Basin Roundtable took no formal position because the Colorado River Roundtable’s formal request for state funding had been withdrawn. But speakers, including Sean Cronin, executive director of the St. Vrain and Left Hand Water Conservancy District, said that if the study is to be applicable to all of Colorado, then it needs to be a state-supervised study. In an interview the next day, Joe Frank, chair of the South Platte Roundtable, reiterated the belief that “we need one voice” about Colorado River water. “I think the metro and the Eastern Slope hopes that state takes the lead in looking at this issue of risk analysis and curtailment and everything,” he said. He also suggested concerns among existing diverters of Colorado River water about the impact of future diversions. “They have as much issue with a new transbasin diversion as the Western Slope would,” Frank said. Editor’s note: Aspen Journalism and the Aspen Daily News are collaborating on coverage of rivers and water. The Daily News published this story on Monday, Nov. 21, 2016.